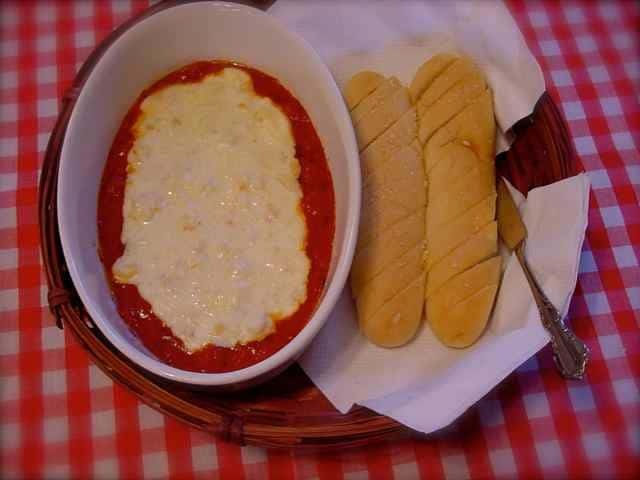 Olive Garden Sam Remo Dip is a popular appetizer that the Olive Garden has served. Marina sauce, and seafood make this dip extra special. Make the classic Olive Garden Sam Remo Dip at home. In a 2-quart saucepan on medium-low, heat olive oil and blend in flour. Add to flour the liquids that were reserve from the shrimp and crab; stir well. To this sauce, add cubed cream cheese, salt, crushed garlic, and horseradish; stir until smooth. Add asiago and Parmesan cheeses and stir until smooth. When the cheese has melted and sauce is smooth, add shrimp and crab; blend well. Simmer until heated through. Finally, add half and half a little at a time until the seafood sauce starts to simmer and begins to resemble warm pudding. Let sauce simmer for 12-15 minutes. Stir sauce so it does not scorch on bottom. Spray a shallow 9-inch baking dish with nonstick spray. Add drained marinara sauce and carefully spoon seafood sauce on top. Sprinkle with freshly shredded Parmesan cheese and place in a preheated oven at 325 degrees, for 10-15 minutes, until heated through. Dip should not brown on top. Thanks for sharing this delicious appetizer. serve this at my local OG anymore so now I can have it at home!! worth every minute!! 🙂 Thanks!